Multiline Address Textbox Feature - Douglas Computing, Inc. The DC Envelope printer app allows you to use either the default set of fields for entering address street information - Address 1, Address 2, City, State/Province, and Zip Code - or a single multiline field, which can contain more lines of data (as many as can fit onto an envelope). The single multiline field can also support varied types of addresses (e.g. UK addresses). WARNING: If you are new to using the DC Envelope Printer, or / and you have no return address or address records saved, you can use the following instructions to switch between using standard fields, as well as the multiline address field, to see which suits you. 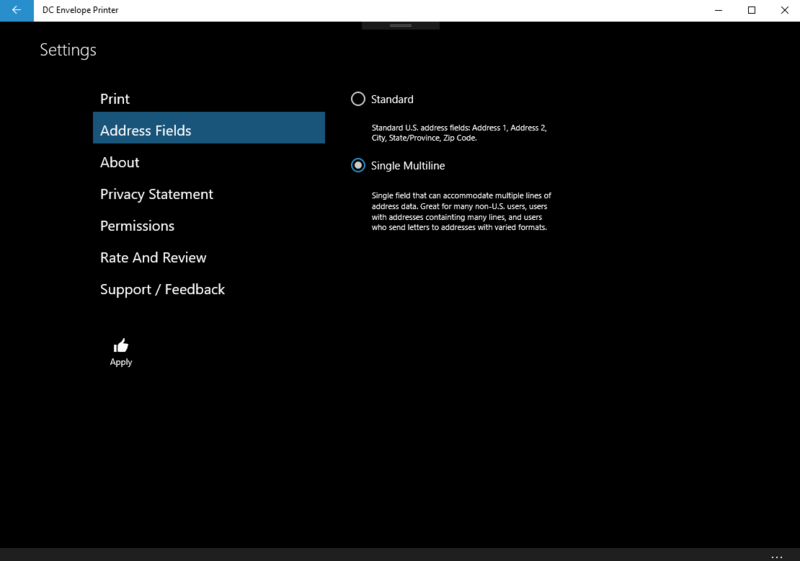 However, if you have an appreciable amount of data currently in the database, switching from standard fields to the multiline address field, will result in your data being automatically combined into the multiline address field, similar to the way your data is combined and deposited onto the envelope image on the main page of the app, when you use the Apply button on the Configure Envelope page. Your data will be fine, but you will not be able to go back to using standard address fields, without incurring loss of data. If you try to move from using a single multiline address field to using standard fields, only the first line of your street address data will be saved. The rest of your street address data will be discarded.